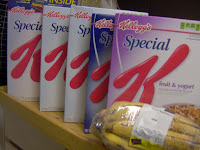 Pay $2 and get 5th Special K FREE! Target has $5 off 4 here. It's a manuf Q so you should be able to use it at Winn-Dixie. Pay $3 for 5 items! 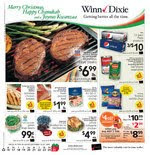 See other deals in the Winn-Dixie ad here! I didn't mean to take a break from blogging. But after Weds. two weeks ago, I just couldn't make it to the computer! I was absolutely clueless about any deals posted online too. And hardly used any coupons in my last minute shopping trips! I hope you all had a great Christmas. We had a very simple Christmas Eve dinner. (Hubby had the flu so it was a very silent night!) Christmas Day could have been a little better. (Baby boy was too excited when he woke up and forgot to use the bathroom.) Since last Christmas we have started letting the kids open presents at their own pace. So if they want to play with something, we stop opening other presents and let them just play with that new toy. Opening presents stretches out the excitement all day long. Which is more fun at this age. Saturday, of course, marked the first day of clearance shopping. Target, it turns out, started their 50% off markdowns on Christmas Eve. But by yesterday it had gone down to 75% off! We saw the Princess and the Frog. This was the first book in English I remember learning to read. Although I am truly sad the movie is not like the book at all, I still really loved the movie. First African-American princess is just timely. What awesome conversations we had about the Shadowman and his shadows yesterday! I love it when God helps me use everyday secular ideas and turn them into lessons about His truth and love. So now, we have New Year's and Kings' Day to look forward to. Kings' Day is widely celebrated in the Philippines as the day the Magi visited the Christ child. It's the first Sunday of the new year. And kids get presents (usually money) from godparents or other relatives. We go house to house visiting each other. This year, I think I will make the Jesus birthday cake (didn't have time to make it Christmas Day) and we'll sing "We Three Kings" over and over again as my daughter has practiced. I will be out most of the morning but wanted to give you a list of grocery ads here in case I don't get to write in the next couple of days. Why is December so busy? We all know when Christmas comes every year. It always creeps up on me! We all know the Angel Tree at Christmas time. But at Wal-Mart, I saw a tree near the non-food entrance with these paper notes: Be a Santa to a Senior. I picked up one for a lady asking for toiletries. We can surely do that! With all the stockpile from CVS and Walgreens, toiletry gift bags is my gift-giving niche. 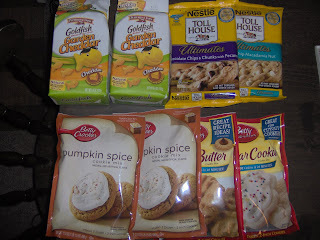 I have been thinking about baking something for my elderly neighbors. I'm not sure if they are diabetic or have other medical conditions. Since I don't know them well, I didn't want to just go up to them and ask health questions. But toiletries, I can think up on my own. And it wouldn't cost me anything. So if your budget is holding you back from holiday giving, think outside the box. As for me, I think it was God's way of honoring a heart's desire to do something more this holiday. 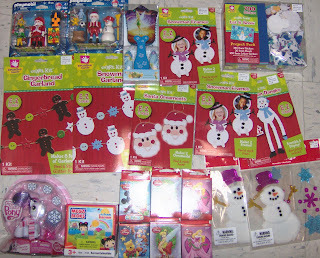 I really want to do Toys for Tots or Angel Tree, but I'm not finding the right deals. I didn't think about seniors needing everyday items we take for granted. So this is an exciting way to give! Our Wal-Mart used to have a Blimpies Sub Shop. After 2 owners, they gave up on the idea. So now it's become the clearance center. Odd too, since this store loves to make a scavenger hunt out of bargain shopping. Now, any super-cheap T-shirt finds it's way here, right by the front door. Clothes are marked down to $3 or $5. Toys and seasonal items, too. So, if your Wal-Mart has remodeled an area into Dollar Wal-Mart, check it out. You'll be sure to find a great bargain. Guess what little man is getting for Christmas? The Bumblebee is (top left) $10 from $23. 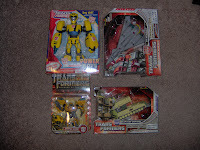 The other ones (all transform) were on sale at a different Wal-Mart for $8 each. 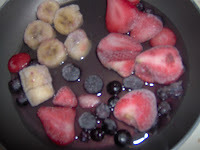 Cook sliced fruit over medium heat: berries, bananas, apples, or pears. Cook to simmer for few minutes until mushy. Mix a heaping teaspoon of cornstarch, 1/4c sugar & 1/2 cup of water in a bowl . You can also put it in a jar and shake it up to get lumps out. If your fruit is sweet enough, use less sugar. 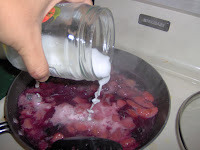 Add to the fruit and simmer until it thickens. Add more water to thin out. Add more cornstarch/water mix to thicken. Just NEVER add the cornstarch directly to the hot pan. The lumps will not be pretty! This idea came from making apple pies. 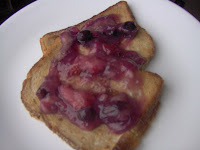 Spice up breakfast with this concoction: French toast, pancakes, waffles too. It's healthy too: pick the fruit in the summer and freeze enough for the year. Sam's Club also sells frozen blueberries & strawberries at a reasonable price. I stopped by Target Saturday because my receipt showed that the Boggle coupon I used did not get deducted. While there, I bought 12 cans of veggies for $0.32 each after Qs. But, this week, Target has Del Monte vegs for $0.50. Use this $1 off 4 coupon to get them for $0.25 each! Mott's is still $0.89 with Target's $1 off Q. And Coffeemate is $1.50 and I used $1 off print Qs. Ok, this is what I need to tell you about Target receipts: they stink! Beware if you use coupons for store promos. It's with these that I often have problems. It looks like the coupon is taken off but then it adds it back to your total. So if you can, buy these promo deals on a separate transaction. And bring a calculator when doing returns. My cashier had a hard time finding one. She did finally see the error and gave me a $5 bill back for my trouble. Hasbro games are on sale. This week again, buy at least $10 worth and get a FREE card game. Use coupons, like $5 off from last week's USA weekend or other print Qs to get them cheaper. Just check the receipt to make sure your total is right! 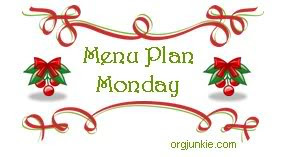 For more menus from hundreds of bloggers, head to orgjunkie. There's a link to Christmas cookies made from Ritz crackers. I think I'll make those! If weather in Pensacola has a gender, it would be a girl. One day it's freezing, next it's t-shirt day. My kids' closet is full of two seasons' worth of clothes. But it's a girl's prerogative to change her mind, right? And I can't complain when I get to enjoy a nice breeze without a hat and scarf around my face. It was nice to enjoy December for the Christmas season and not the cold. To me, it's only right to freeze to death if there is snow to catch your fall. And it hasn't snowed here in 16 years. All this to say, we had a great Christmas dinner at Church. Then we enjoyed the beach feeding seagulls. I was excited when I signed-up to bring potato salad. Preparing potluck food is one of those "homemaker" milestones for me. Then last week, they gave me this huge, commercial-sized baking pan. I almost fainted. That's 10 times my normal recipe. I put off making it until 7am this morning! It's a pure miracle that it got cold enough to serve by 11am. 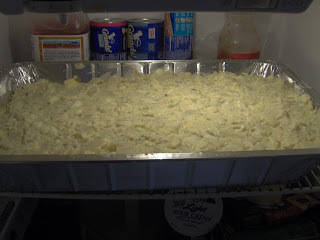 So 15 pounds of potatoes, 24 hard boiled eggs, and a jar of mayo later, it was a success. Hubs helped peel potatoes and eggs. 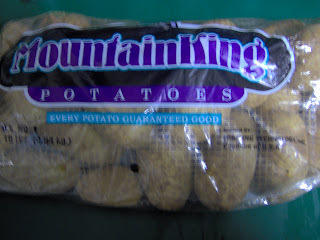 He even thought of using the cold setting in my hairdryer to speed cool the potatoes. And the kids helped too. I was a little stressed but I could see the love of our family for each other. It was the best potato salad I made and I don't think it was the spicy brown mustard I used. I think it was because it's made with love. Cheesy? It's true. To this! It took up the whole shelf in the fridge. Last week is a blur. I can't remember what we did. I did remember to pack the kids snacks whenever we ran errands. 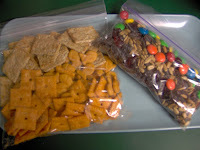 This snack mix came in handy- Kashi TLC crackers, goldfish, Cheez-Its were mixed with a bag of M&Ms, sunflower seeds, raisins and dried cranberries. I separated them this way to keep the crackers crunchy and mixed them together the day we ate it. This is a great way to use up leftover crackers and mix in healthy stuff with kid-approved snacks. 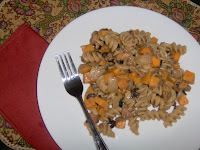 This sweet-potato stir-fry had black beans and pasta. Weird but tasty. We're trying to eat more veggies. 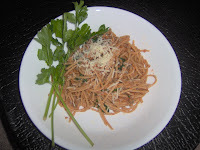 Speaking of veggies, we had another pasta dish for lunch. I mixed a small can of tomato sauce with 1/4c pumpkin for the sauce. Plus a handful of parsley to sauteed onions, garlic and browned beef. It was yummy! And I didn't need to use up a whole jar of spaghetti sauce. I picked up my free stuff at CVS this morning. Don't forget you'll have until Tuesday to do the same. It's not much but extra gift labels, tissue and bows for the price of tax is a great deal. I didn't know CVS has deals for seasonal items until this year. Before, I always went to Wal-Mart for everything. Not anymore. So, instead of waiting for after-Christmas clearance, I can get them now when I would need it. Having a limit of 2 keeps me from being a packrat, too. There were glitches (1st day of deals). Some of the items I bought (like white tissue paper and smaller bows) did not give me back ECBs. Even though there was a sale sticker in the box, the Qs didn't print at the register. I think they haven't finished putting them all in the system. Good thing I caught it on my receipt at the parking lot. Of course, the cashier was quick to fix the error. Which is why I love CVS! No waiting for a manager. She knew what to do and I left as a happy camper. Mummy Deals is a cool blog by a fellow MOPs up in Chicago. Check out her CVS and Walgreens Deals starting tomorrow. I check her site by Thursday because she sometimes has them up that early. To see the ad scans, of course go to iheartcvs.com or iheartwags. There is another 4-day sale at Walgreens and that ad is here. You'll get $5 for spending $25 before coupons! Just remember that this deal does not rollover. Hallmark $3+tax New Family Circle has $5 off $5 Hallmark Coupon! I really hope to scale back on shopping in the coming year and live off our stockpile for a while. Shopping is fun but it really does take a lot of time and organization, both of which I am lacking! And I'm sure my time would be better spent exercising off all the holiday goodness I've gained in the past couple of weeks. 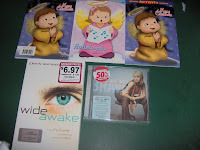 So, after my headache at Walgreens (that Olay coupon kept beeping too), we went to Lifeway. They mailed Rewards Members a $10 coupon. I'm not sure if they do this every year & I was surprised to get it. It was very crowded out there by the mall area and parking was scarce. Looks like Christmas is around the corner. Inside the store was no better with shoulder-to-shoulder browsing. We came out triumphant. Everything for $0.32! Plus a chocolate truffle filler item which I couldn't wait to eat. If you are not yet signed up as a Rewards Member, I would suggest you do so next time you shop. You'll get a punchcard that gives 20% to 30% off when all the punches are done. Plus a quarterly sales catalog that sometimes has coupons. And you'll get updates on events like kids' movie screenings that are always a lot of fun to attend. Instead of snow we have rain showers all day. It's kinda gloomy and it's messing with my depth perception- my shopping glasses that is. I came in to Walgreens today to grab some grocery staple items and a few of the deals. But after the 2nd transaction, I ran out of money. (Didn't do my list with the prices on it and messed up the Ragu deal, forgot the coupon.) Plus I was hungry. So I was able to find most of the deals, even though it's already Saturday. But I decided to put the rest down and not buy the extras since I'm supposed to save money, not spend all of it. Although, now I'm going back and forth in my head about going back out there and getting the rest. I spent $20.65+tax, got $5RR & $2RR. 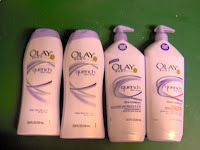 I then used both for the Olay products and spent $9+tax. I used the $5 RR from the 1st transaction, so another one did not print out. If I could start over with this shopping trip, I would have bought the other products that would have been free after RRs first then bought the Olay products. It only makes sense to get the one that won't give RRs back at the end. That's a rule of thumb that I forgot. And it cost me $5RRs. But since I turned in this Olay Rebate for $20, the Olay products should be FREE and I get half my money back from the 1st trans. Even though, in my eyes, this shopping was not super, I guess I won't be going back or making price adjustments for forgotten coupons. It's cold and wet outside and I'd rather take a nap! P.S. If you are doing this Olay Rebate, the safest bet is to get it at Wal-Mart or elsewhere it might cost less than $9.99 and not bother with the coupons. I used 2 Buy Bodywash, Get Lotion FREE coupons which show up distinctly in my receipt (-$9.99 right under $9.99 price). So I'm not even sure if they will get me the rebate, since I obviously got these item for free already with the coupons. Ay! That's what I get for not reading this post carefully. Thanks anyway, H2S! Santa Sightings Around Pensacola and More! If you're idea of pictures with Santa leans towards the free side, and, far, far away from the mall, then you are in the right city! Within half an hour drive around Pensacola are lots of different places Santa is sure to visit. *At the Bass Pro Shop, you'll get one FREE picture with Santa. But please be prepared to wait in an unbelievable long line. Unless you get there in during the week in the evening. Bring your camera and let the kids pose around different displays. We had a great time just trying all the games and doing the crafts (only on the weekends). We took a picture with Santa in the background because there was no way we were waiting in line that long. The kids did end up talking to Santa when he was at Wal-Mart! That is guaranteed no wait. Too bad it was only the past two weekends. * If you live near the Perdido area, the Innerarity Point Firehouse gives Santa a ride on the firetruck and they drive around all the neighborhoods throwing candy and beads shouting Ho! Ho! Ho! Christmas Pageant at Hillcrest: Fri, Sat, Sun at 7pm, also Sun 4pm! *A few years ago, we went to Big Lagoon's event. Not only is the park decorated with lights. But near the Pavillion, the lights are coordinated with the Christmas music. It's really neat. They had a mini concert while we waited for Santa plus several arts and crafts take home projects for the kids. Hot cocoa and cookies were served. Best of all, it was all FREE, even the park entrance fee! * We also went to Marcus Pointe's Spirit of Christmas to see Kirk Cameron speak. That was awesome. He gave a powerful message and invitation. We stayed for the dinner too. I have never seen a more organized food line. The line moved so fast, next thing you know you're sitting down. If you go, arrive early to get parking around the Church. Otherwise you will have to park a few buildings down and take a shuttle bus back to the church. Our town has only one Save-a-Lot. And it's in one of the most congested areas (as far as small towns go) so it's hardly ever worth it for me to drive over there. Once in a while though, I'll remember to go on to their website and see quite a few great loss leaders. Sometimes, Wal-Mart will price-match these deals (even without a copy of the ad). It really depends on your cashier. It's been rare to find Save-A-Lot's ad in the paper lately. So if you prefer to shop at Wal-Mart and can grab a copy of Save-A-Lot's ad beforehand (or print a copy), that might be the safest way to price-match. If you decide to go to the actual store, please know that you have to bring your own plastic/reusable bags because they will charge you to use theirs. I've been there a few times and I liked it well enough. It's pretty clean and friendly and much less crowded than Wal-Mart! Come to think of it, our area has other smaller grocery stores that do a fairly decent job staying competitive with Wal-Mart. Grocery Outlet off Fairfield and in Pace have their own butcher. Did you know Wal-Mart and Target are the only ones without one?) Also The Butcher Shoppe across from Grocery Outlet is famed for their meats. We might even have a Piggly Wiggly in Pace, too. 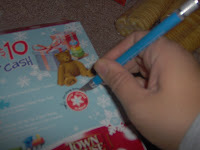 Hallmark $5 off $5 Coupon- Cheap Gift Wrap! 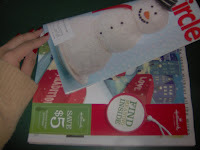 Hallmark has $5 off $5 coupons in magazines and also to PRINT. Thanks H2S! You can probably print two of these. 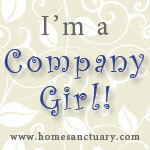 Our Hallmark is independently owned and is in a shopping plaza instead of the mall. But the cashier had no problem taking them. Right now they have Christmas wrapping for Buy One for $4.99 Get One for $0.99. 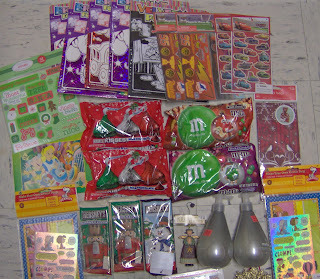 They also have lots of 99-cent cards and a smattering of overly-priced clearance items. I also saw a photo ornament for $3.29 (So get two for $6.60 and get $5 off.) 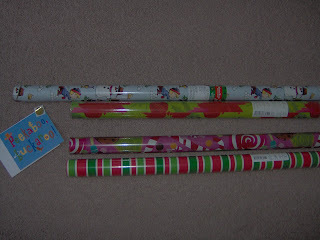 I picked up 4 wrapping paper and a 99-cent card for $3+tax. I've been noticing in the past few weeks that whenever there is a new high value coupon in a magazine, within a couple of weeks it comes out as a printable coupon online. So that means double coupons. Rewards Gold I think is the company that provides free magazine subscriptions. I have 3. It's completely frivolous, if it weren't for the coupons they have in there, a real waste in ink and trees. I've also used Swagbucks to get a subscription to Real Simple for FREE (a mag I used to get back in college and paid regular price for the subscription!) But in reality, I love magzines! Snippets of info packaged in glossy paper covering varied subjects NPR would never talk about. I just love it! If you are great friends with your librarians and ask nicely, they may let you take out coupons too (as long as they are booklets not in the same page as an article). I would ask about issues at least a month old. Walgreens 4 Day Sale Starts Today! Walgreen 4day sale starts today. The deals here plus other deals this week are good through Saturday. You'll get $5 RRs for spending $25 before coupons. 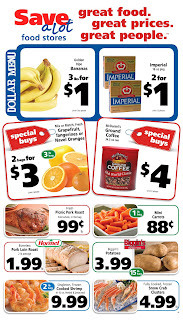 They have great sales, even on groceries, this week and lots of RR deals that will give you FREE items. 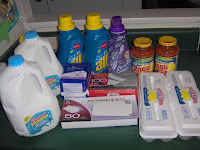 Side Note: For those who use EBT cards for food, this is a great tip for you- buy $25 worth of food items and get $5 RR to use on non-food necessities like toilet paper. Lookout for other stores that have grocery deals that give you store credit to use on other items (like Target's $5 gift card deals and CVS extra care bucks). Say, you're in need of detergent. Target has a gift card deal for Keebler cookies. You don't care for cookies. Do the deal anyway and use coupons to lower the cost. Then you'll get $5 for the detergent. Plus, bring the cookies to potluck or kid's events. 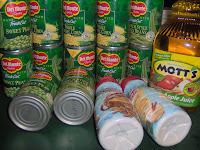 Now you won't need to buy something for that, saving you even more.. Planning for $20 extra in your EBT card every month for these types of deals will yield a lot of savings on non-food items in the long run. Use all coupons, get $5 more! Thanks, IHeartWags for ad scan and deals! 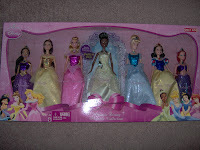 At Target today, I stopped by to pick-up the last Disney Princess Barbie Collection. It's priced at $49.99 for 7 barbies. Using two $5 Gift Cards from the Keebler snack deal dropped my total to $40, only $5.75 per doll. I hope this will not be overkill since my daughter has too many dolls as it is. 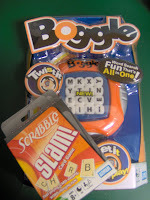 H2S posted this deal for Boggle. $12 at Target, but get a FREE Card game. Only for $10 or more Hasbro games. Plus I used a $5 Q from this Sunday's USA Weekend. So, $7 for 2 games! While there, I picked up a few cheap or free items. Thanks to this new blog: Totally Target. If you are a fan of I Heart Publix, you'll like this new Target blog. It's by Kerry who edits for Michelle's Publix site. *perfect for potluck net week! None of the Keebler crackers have the $10 Toy Voucher logo. But in the party food section, there are Keebler Gingerbread Men cookies for $3. These have the Toy logo! 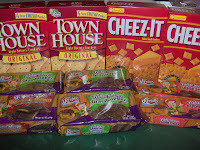 I tried to use two $1 off Kelloggs or Keebler Qs printed from Save-A-Lot website's. They beeped. The cashier would not push it through. This reminded me that since it is the holidays, there will be seasonal hires who may not be used to your coupon ninja skills. Humor, patience and courtesy are your allies to winning over the cashier. You must prepare with advanced decision making (a new concept I learned at Bible study just yesterday). These are if-then role-playing scenarios played out in your mind beforehand. 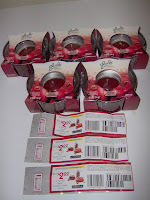 Example of what I did: If the cashier decides not to take my coupons (I thought), I will point out that these are Manuf Qs with Save-A-Lot logo but will buy these irregardless. Wel, she decided to go to the manager- I said out loud I would buy them without the Qs, which put her at ease I think. The manager said if they beeped, don't take them and they beeped. But I had already figured that even without the $2 Q, each box is only $0.50 after the gift cards. And I was using the gift cards for the next transaction anyway. So a little advanced decision making saved me and the cashier frustration. Plus, I could tell she was a bit nervous because I had a coupon for almost everything I bought. She said she could lose her job if she messed up processing the coupons. A little extreme, I think, since box stores lose more money on shoplifting (from customers and employees) than little ladies' coupons. But I can understand the paranoia too well, especially in our current economy. So we all need to remember to be gracious and smile a lot. In fact, teeth whitening might even come in handy. Just kidding. I also saw: Bargain DVDs $2.99-$7.99 and Madagascar I was pictured. So the most it can be is $8. They may have a decent movie selection. *If you are donating to Christmas baskets this year, you can also add fruit! $3.99/lb New York strip steak (bone-in, family pack, w/ $15 additional purchase, limit 2) -seems like a great stock-up price! I thought it was about high time I shared with you how I organize my coupons. I've hesitated because it's been a while since I've kept them organized. Since I've started blogging, I've learned more about deals and coupons than I can keep up with. And I've quickly outgrown my simple methods. 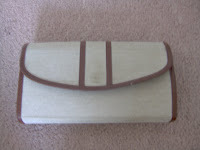 I've been perfectly happy with this coupon purse. It's really just a tickle file I bought about 3 years ago for about $3.50. I used legal sized envelopes, one per alphabet letter. The envelope was sealed with the top cut open so I could easily slide the coupons inside. Since I alphabetize my coupons by brand, it was so EASY to just clip and file. But this only worked when I would buy one newspaper. Now I often buy two plus I print lots of coupons. Soon my simple clutch-like organizer grew so fat that the button kept popping off and I had to hold it together with a rubberband! There was another system I heard about but I put it off for a long time: The binder system. You had a large binder or those Trappers we used in middle school. Coupons would then get sorted in these baseball card organizers. It seemed unappealing and complicated! But I had clearly outgrown the coupon purse. So now I have a binder and it's blue and kinda blah. I might show you a picture. It took a long time to transfer all my coupons into the tiny pockets. I still have more to transfer! Now, I'm just waiting for them to expire so I can just get rid of them. One thing that's great about this new system is that I now think about which coupons to keep. After all, it's got to be worth the struggle squeezing it in there. There's a lady at my church who sends expired coupons overseas so she gets lots of coupons from me (many not expired). I figure, if I really am desperate for some coupons, then I can always get them on ebay. 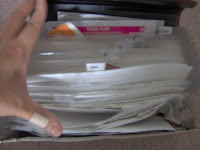 It may be hard to get coupons in the binder, but it sure is easy getting them out! Many times I've seen store clearance and flipped open the binder to quickly pull out a coupon. I've done this for strangers and friends I've bumped into at the store. So far, this ease has made the hassle of organizing worth it. Publix deals pictured here are good through Tuesday. This is all I bought there this week. I paid $2.97. These "healthy" garden goldfish tastes pretty good. The cookies are not healthy but cheap! The plus side is baking fun with the kiddos. As much as I love homemade cookies, I like saving time better. 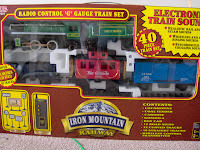 We also got this train for $37 mentioned in the post below. Some of the cars open and are perfect for stashing little treats! I'm excited to use it since I never had one growing up (no boys in our house). Check out how others did with their shopping here or here. Many saved 80% or more this week! Also, Michelle at I Heart Publix has the Sneak Peek for Weds Ads by Monday. See what deals you might partake this week here. You could even buy coupons now online or ebay to get ready. I listed highlights but you see more deals I posted earlier or at MSM. The total was $56.21. I used $8.50 Qs, $5 off $30 CVS Q, & $40.45 ECBs. Final cost: $2.26+tax, plus $38.47 ECBs back! Monday night, all Merry Brite Hats and ornaments are sold out at my store! But I got a rain check and they may get more in next week. Last year I was able to get the ornaments on 75% off so I'm being optimistic that I can get them FREE this year! Heads up! There's a $2 peel-off coupon on Zantac 150. It covers the whole box and is hard to spot without the small red $2 off banner on top. Hubs is still amazed at how I can spot these coupons! Pay $6.99, Get $8.99 ECBs, make $2! Don't forget to scan your CVS card in the price scanner. I got a $2 off $10 CVS brand coupon. Both nuts and lotions are CVS brands (Essence of Beauty and Gold Emblem). 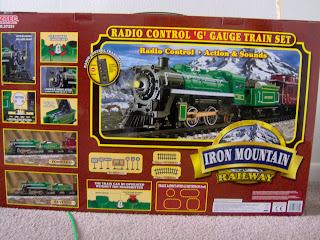 We got this new train set at Publix last week for $37 + tax. Sale price is $50. I used $5 off $30 from the new 9th Ave Publix, $3 off in Winter Savings booklet, and $5 Walgreens RRs. 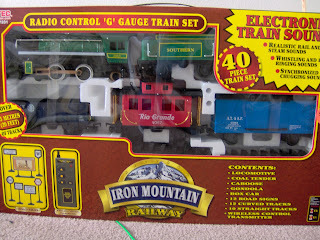 It's a beautiful train but battery-operated not electric. 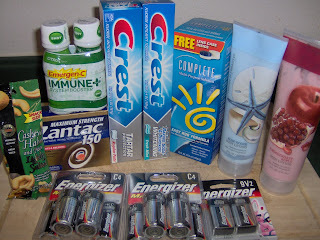 So it's great that CVS is having another Energizer sale. Now we're set! I used up all my ECBs a few weeks ago and decided to reign in the CVS spending by getting $50 CVS e-gift card. They also had a promo where you get an extra $5 e-gift card for any $25 card purchased. Then I would only use these cards and see how far I could go. Apparently, not far at all, more like one shopping trip! But I got $50+ ECBs back that same trip. So now I locked myself into having too many ECBs to rollover every month. Eeek! Hence, the Zantac and most of the items I bought. I still only paid $4.39 out-of-pocket today for all of these products. Which is great, if I was planning to open my own drugstore or something. So lesson learned: stick with small transactions! 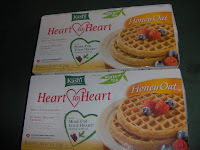 Kashi Waffles on clearance, $1.46 each-FREE after Qs! Get a filler item for $1.08 because you will have overage! Heart to Heart was also on sale but it's sold out at my store. Regular price only $1.99 so would still be 2 FREE boxes. 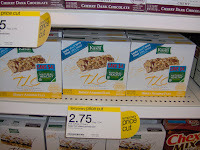 Check out Hip to Save's lengthy post of Target sales with coupon match-ups here. Also, Target coupons are here. Some are manuf Qs and there's no way to tell until you print them. 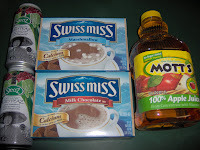 Heads up: score two FREE Swiss Miss Hot Cocoa 10packs by printing two $1 Target Q on page 15. Some or all of these coupons may be applicable. If you find Keebler crackers with Toy Logo on them, you can submit for a $10 Toy Voucher. Only $0.30 each after the Gift Card! 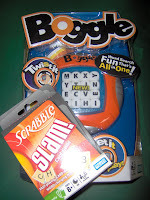 Pay $7 for Boggle and Card Game! Glade Deal: ongoing through Dec 26! Just found out that my mom has been visiting my blog. Hey Mom! Thanks for showing me coupons when I was a teen. It's sure is different from how we shopped back in PI! Go to MSM for more deals and scenarios! Zantac & Complete have $1 Qs but our region did not get them. 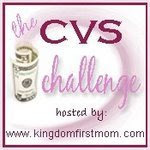 On to the CVS $5 Challenge. See other ways to stretch your $5 here. A couple of years ago, before using internet coupons and reading other blogs, I used to figure out my deal scenarios using very little cash. Since then, I've saved up enough so that I can get more and build up my ECBs. But sometimes I do think back on those simpler times when I only got what we needed and didn't have to worry about hunting down coupons or figuring out storage for the stockpile. While talking to my mom this week, she told me that she's been trying to figure out CVS. Looking at the deals, she would ask herself "Do I need this?" I need to ask myself that too! I often get carried away with getting stuff for free, I don't even think about what to do with all the free stuff. Now that I've got that off my chest, back in olden days when I had only about $5 to spend at CVS, I would keep rolling the ECBs by doing a few transactions. Since I shopped Sunday mornings or on weeknights when the store is slow, the cashier had no problem helping me. I paid for the first transaction then use the ECBs that would print from the receipts to pay for the other transactions. 3. Calling the store to see if there are any sale items left if I can't shop until after Tuesday. The free one after ECBs go within a day or 2. I remember being frustrated many times finding the shelves empty and vowing never to shop at CVS ever again. But really, I just needed to have a different shopping strategy and get a raincheck!